G.H.J. Rogers was a dentist and a microscopy enthusiast. He was a long-term Fellow of the Royal Microscopical Society and Member of the Quekett Microscopical Club. Collectors are probably familiar with Rogers’ bright white-on-red labels (Figures 1-3). He also used smaller, black-on-white name labels at times (Figures 1 and 2). Less common, or perhaps less-noticed, are his large black-on-grey specimen labels (Figures 1 and 3). 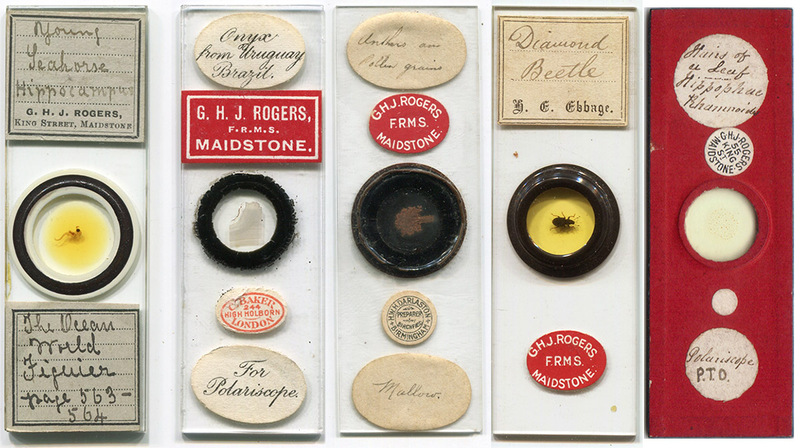 Those secondary labels evidently led Brian Bracegirdle, in his Microscopical Mounts and Mounters, to assume that Rogers was a slide retailer, a “supplier of a range of mounts”. However, my investigations have not revealed any evidence that Rogers was a professional seller. To the contrary, he probably did not need the extra income. Rogers was a moderately well-off dental surgeon, who kept live-in servants. He grew up in similar circumstances, his pharmacist father providing the family with a governess and domestic servants. Rogers frequently travelled from his home in Maidstone, Kent, to microscopical Society and Club meetings in London (an approximately 40 mile / 65 km trip each way). 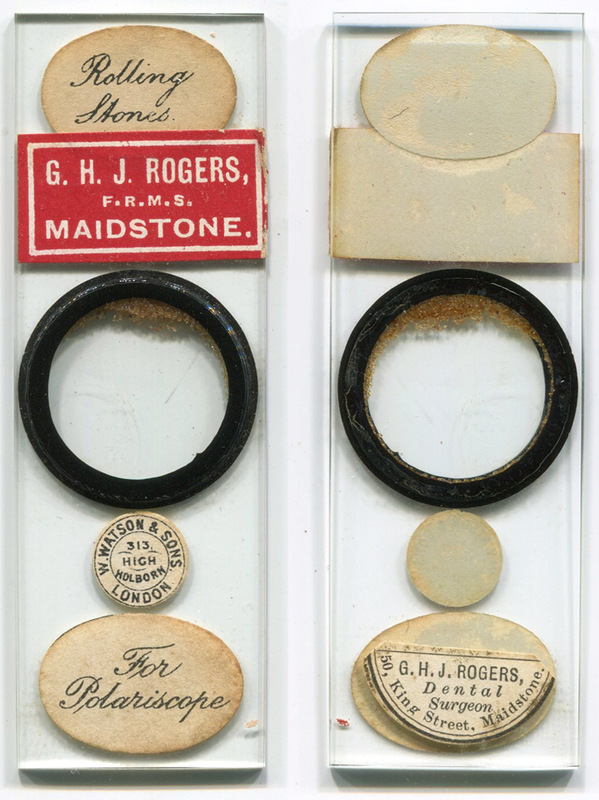 The custom-printed specimen labels indicate that Rogers prepared his own slides, in addition to acquiring slides from other makers. It is reasonable to conclude that the secondary labels from Rogers were a means of labeling his property, which is a good idea if one takes them to meetings where they will be passed around. The frequency of Rogers’ slides in modern collections is probably due to their dispersal among his Society and Club members. This is similar to the dispersal of slides from the personal collections of other microscope enthusiasts, such as John Furze. Figure 1. 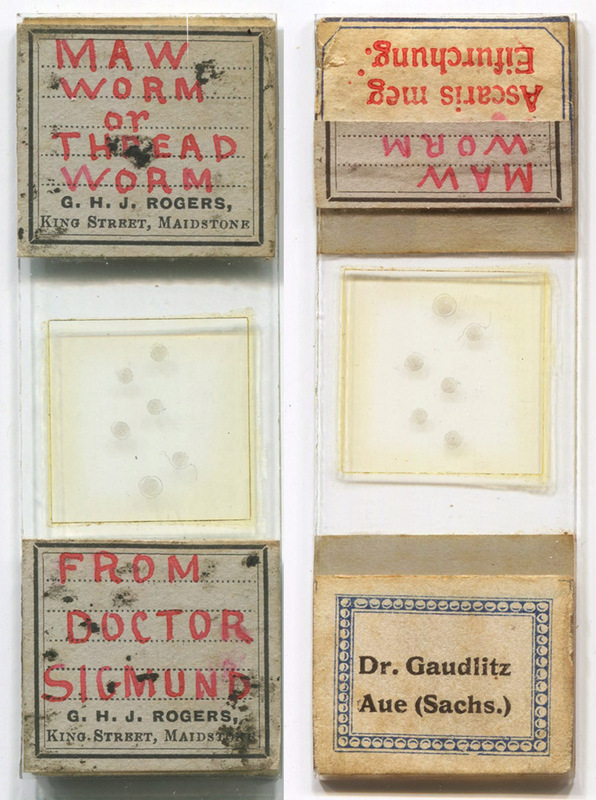 Microscope slides that were prepared by G.H.J. Rogers or were part of his collection. The slide on the left, with the black-on-gray labels, was likely mounted by Rogers. The other slides were acquired from professional slide-makers (L to R): Edmund Wheeler (1808-1884) - this slide was resold by Baker), Herbert Darlaston (1867-1949, active from 1902 onward), Henry Ebbage (1862-1949, active from 1885 until 1910), and Charles Topping (1799-1874). The round label on the red-papered Topping slide gives his post-1903 address of 55 King Street. Some images adapted for nonprofit, educational purposes from internet auction sites. Figure 2. Front and back views of slide that was prepared by/for Edmund Wheeler, and later retailed by Watson & Sons, from G.H.J. Rogers’ collection. The rear label states Rogers’ address of 50 King Street, Maidstone, Kent, where he lived from ca. 1885 until 1903. Additionally, it does not list him as a Fellow of the Royal Microscopical Society (F.R.M.S), implying use prior to his joining the R.M.S. in 1899. The white-on-red label is a later addition. Figure 3. Another slide with Rogers’ custom specimen labels, although prepared by another mounter, presumably Dr. Gaudlitz of Aue, Saxony. “Maw worm” is a general term for a parasitic worm that infests the stomach or intestine. “Threadworm” is a common name for roundworms of the genus Strongyloides. Figure 4. G.H.J. Rogers’ bookplate, inside his copy of G.M. Arnold's "Robert Pocock, The Gravesend Historian, Naturalist, Antiquarian, Botanist, and Printer", 1883. Rogers moved from 50 to 55 King Street during 1903. The similarity of this label and the bright white-and-red slide labels suggest that their use also dates after 1903. Adapted for nonprofit, educational purposes from https://pocockherbarium.blogspot.com/2015/03/some-copies-of-g-m-arnolds-pococks.html. George Henry James Rogers was born in Maidstone during the autumn of 1854, the second of six children. As noted above, his father, William, was a chemist and druggist. By the age of 15, George was apprenticed to a local dentist (he was listed as “dentists apprentice” in the 1871 census, although living with his parents). He married Ruth Peters in 1885, and moved from his parents’ home to a new home/dental office at 50 King Street. The Rogers remained at that address through 1903, when they moved a short distance to 55 King Street. George was elected as a Fellow of the Royal Microscopical Society in 1889. He became a member of the Quekett Microscopical Club in 1900. 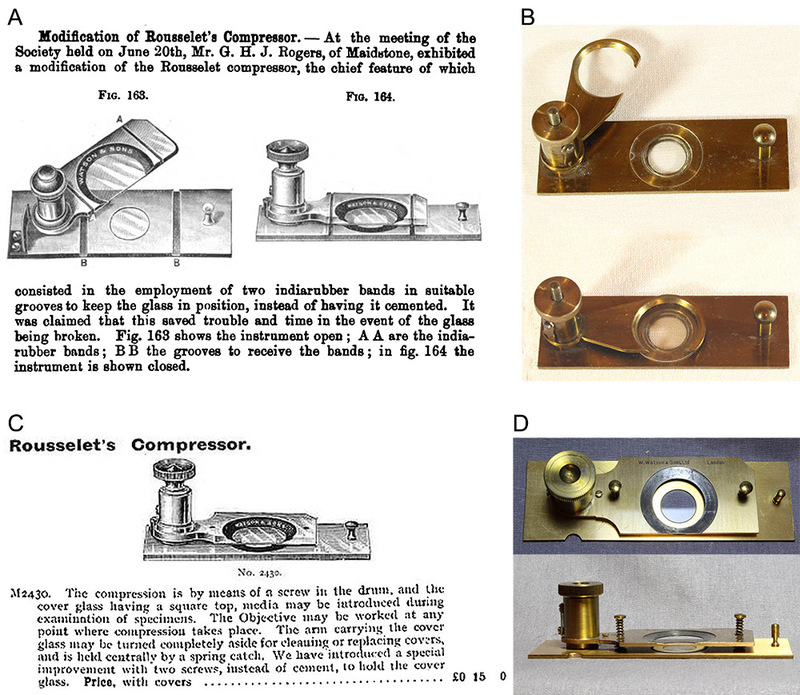 Evidently a bit of an inventor, Rogers developed a modification to the compressorium that had been invented by Charles Rousselet (Figure 5). This compressor includes an upper arm, which is brought to bear pressure on specimens by a turning screw. In Rousselet’s original version, a glass cover slip is glued to the bottom of the upper arm (Figure 5B). Rogers noted the difficulty involved with replacing a broken cover slip: the old slip and glue need to be scraped off, then a new one glued in place. Rogers’ solution was to hold the cover slip in place with two rubber bands (Figure 5A). Watson and Son produced this model commercially for a while, then further modified it by using screws instead of the rubber bands (Figure 5C and D). Another of Rogers’ developments was marketed by C. Baker: a simple device that will immobilize a live fly such that one can observe the mouthparts under a microscope (Figure 6). Rogers’ name disappeared from the Quekett membership rolls between 1916 and 1918. He remained a member of the Royal Microscopical Society until at least 1930. 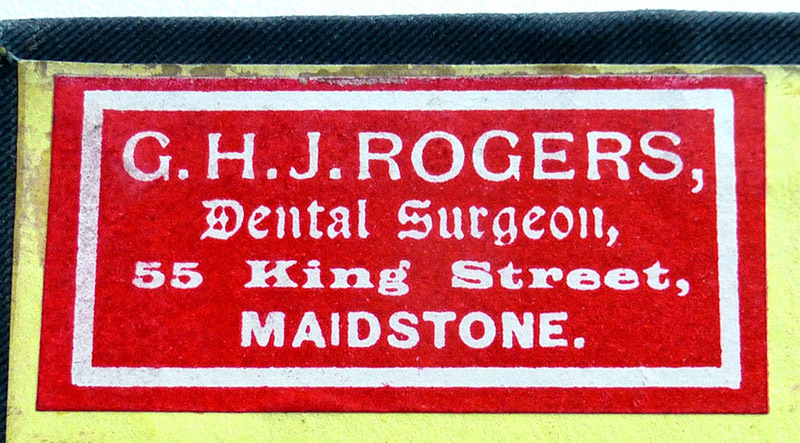 Around 1920, Rogers moved to 2 Bower Terrace, Tonbridge Road, in Maidstone. He was then about 66 years old, and so may have retired from dentistry. Later that decade he moved to Sussex - the 1930 membership roll of the RMS listed his address as Wilton Hotel, Grosvenor Gardens, St. Leonards-on-Sea. G.H.J. Rogers died on December 9, 1937, in Hastings, Sussex. Figure 5. (A) Rogers developed a modification to Charles Rousselet’s compressorium design, and exhibited it to the Royal Microscopical Society in 1900. (B) Rousselet’s original design required the user to glue a cover slip to the moveable arm. Rogers modified the design so that the cover slip was held in place by rubber bands, a design that Watson and Son acquired for commercial sales. 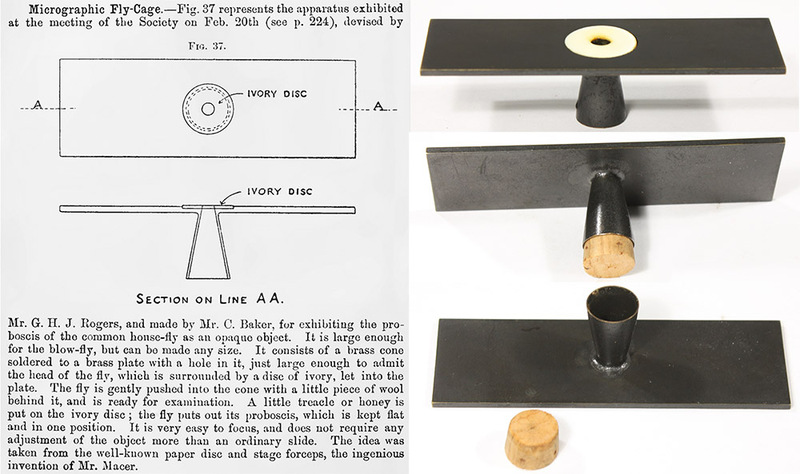 (C) By 1905, Watson further modified Rogers’ idea to use screws to hold the cover slip in place. (D) Watson later changed the design again, to use spring-loaded catches to hold the cover slip in place. Of these changes, Charles Rousselet wrote, “There is absolutely no reason why any one wanting such a compressor should not have it; but I think I must ask these opticians to be good enough to call their modified model by some other name, for I have always disapproved of it…, and it is not my model and very much less an ‘improved’ form of it”. Photographs of surviving apparatus are adapted by permission from https://www.microscope-antiques.com/compressors.html. Figure 6. In 1901, Rogers’ presented another of his inventions to the Royal Microscopical Society: a fly cage by which to examine the mouthparts of a live fly. It was commercially produced by Charles Baker. Figure 7. 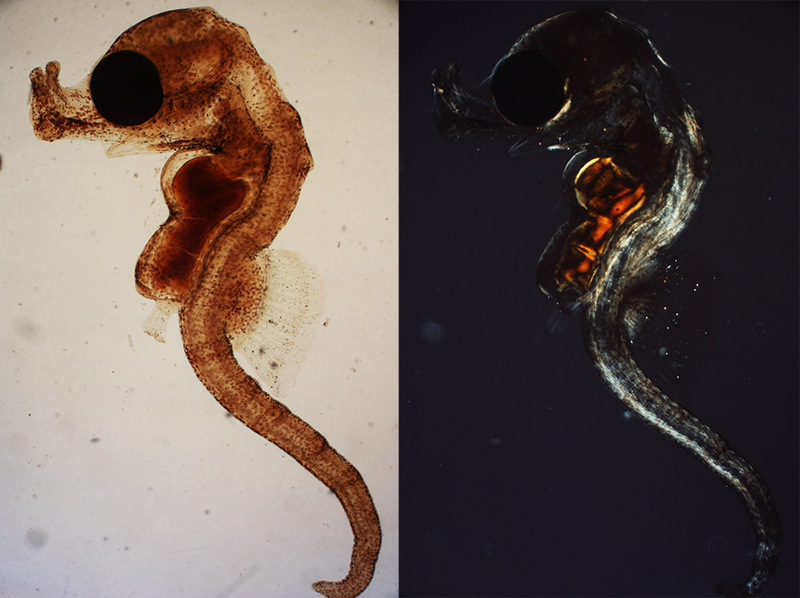 “Young seahorse Hippocampus”, prepared by G.H.J. Rogers (see Figure 1). Images photographed with a C-mounted digital SLR camera with brightfield (left) and crossed polarizing filters (right). On the slide label, Rogers referred to “The Ocean World”, by Louis Figuier, pages 563-564. The seahorse is described on those pages of the 1872 English translation. Thank you to Barry Sobel for sharing images of Rousselet’s compressors on his excellent web pages on compressoria, https://www.microscope-antiques.com/compressors.html, and to Peter Paisley for discussions on G.H.J. Rogers.